Little Penguins are mainly found on the coastlines of Southern Australia and New Zealand. They have several common names. They are referred to as Fairy Penguins in Australia because of their tiny size. 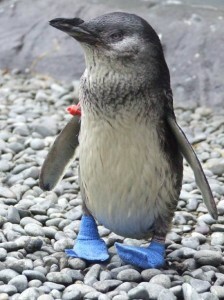 They are also called Little Blue penguins because of their slate blue plumage. Find out physical description of these cute, little, adorable birds below. Size: These Penguins grow up to 30-33 cm in height. 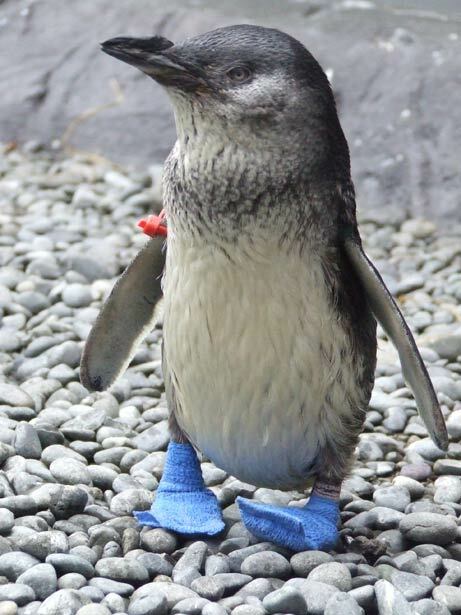 Weight: Little penguins weigh about 1.5 kilograms on an average. Color: The head and upperparts are generally blue in color. However, an immature penguin will have lighter colored upper parts. The ears have a slate-grey shade, fading to white from chin towards the belly. The beak is dark grey to black. The irises are pale silvery or bluish grey or hazel in color. The feet are pink with black soles underneath the webbing. Beak: The beak size ranges from 3-4 cm in length. They are found in New Zealand and also along the southern coasts of Australia. Their range spreads from near Perth in Western Australia to around Coffs Harbor in New South Wales. They often set up their colonies in sand-dune vegetation, sea caves and on headlands. The ocean is the Little penguin’s natural environment. However, they also live in man-made structures such as cavities beneath houses that are built a little raised from the ground level. The behavioral traits of these angelic, little birds are very interesting to observe. The little penguins spend their entire day swimming. They wake up at sunrise and continue hunting into the evening. These birds preen their feathers to keep themselves waterproof. Little Penguins are known to communicate at sea-shore with a variety of calls for declaring territory or calling for mates. When at the shore, they tend to remain within 25 km of the coast but they have an ability to travel as long as 75 km. On land, they stand upright and walk or waddle awkwardly on their hind legs. They are social birds and are often seen flocking together in groups. Most of the little penguins have the same mate for life-time but some of them change mate from year to year. They tend to nest in burrows. These birds feed themselves by hunting fishes such as anchovies, squids, small octopuses, planktons, pilchards and other small sea animals. They may also eat crab larvae, crustaceans and sea horses. Little Penguins are often attacked by predators such as sharks, New Zealand fur seals, and also foxes. 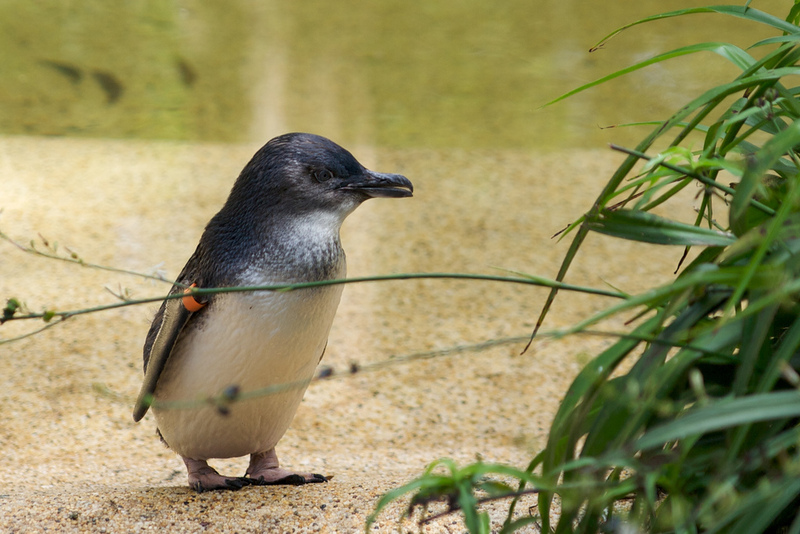 The wings of the little penguins have evolved into flippers that help them to swim faster underwater. The little penguins keep themselves waterproof by preening their feathers with a drop of oil from a gland above their tail. They are excellent swimmers, being able to swim at a speed of 6 km/hr. 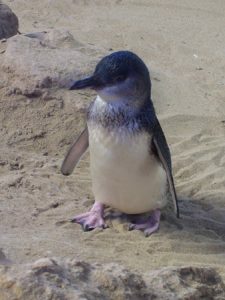 The breeding season of Little penguins vary from year to year and from colony to colony based on the availability of food. Usually the mating season is between June and August. Female Little penguins tend to mature when they are 2 years old and males mature when they are 3 years old. Male penguins return to their colonies and reconstruct old burrows, dig new nests to attract females. Females arrive in June to meet aggressive males who perform complicated courting displays. They lay two eggs at a time. For the 35 day incubation period both males and females take turns in incubating the eggs. Little Penguin eggs take almost five weeks to hatch depending on the food supply. Both males and females take care of the young in the first three weeks. In the next five weeks, the young penguins are fed regurgitated food by the adults. After this period ends they are forced out of the nest. Little Penguins live for seven years on an average. 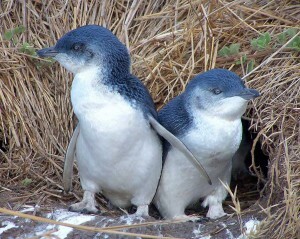 Little Penguins are listed in the Least Concern Category according to the IUCN. In Sydney, snipers have been deployed to protect the colony of Little Penguins. There are few interesting facts about this cute species of bird. Little Penguins are the smallest species of penguins. The word Eudyptula in its scientific name means ‘good little diver’. Little Penguins have better vision under water than on land. These penguins are the only penguin species that breeds on Australian mainland. Here are some Images of these incredible birds known as little penguin.